Just typing that title doesn't seem like anything I would have ever write about. 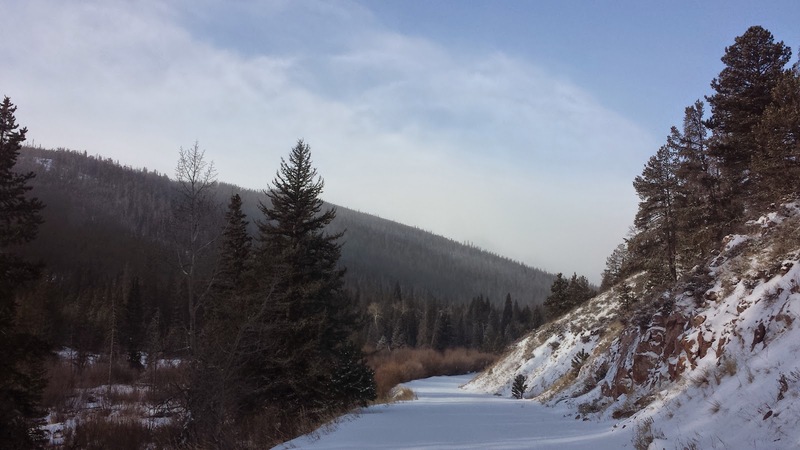 Not in my lifetime did I think I would make a trip to Colorado, a state that I have never been to, to go ice fishing. A combination of a lot of things made this trip happen. A long holiday break from teaching, no ice in Central Iowa, an understanding wife, and a friend with a crazy idea made all this come together quite seamlessly. Jacy and I packed the truck up at about 4pm Saturday and started to head west. After seeing several landmarks, including the Lane Frost statue in Cheyenne we finally made it into Colorado near Red Feather Lakes. We fished most of the day on Sunday, hitting three different small lakes. 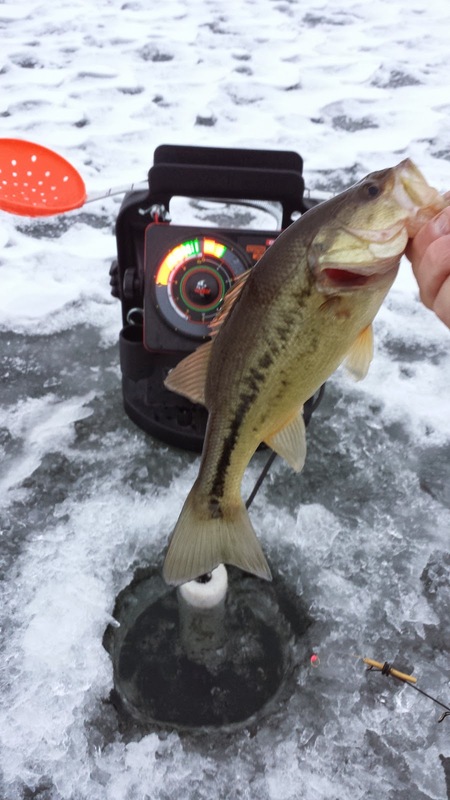 To my surprise we only saw one other small group ice fishing. 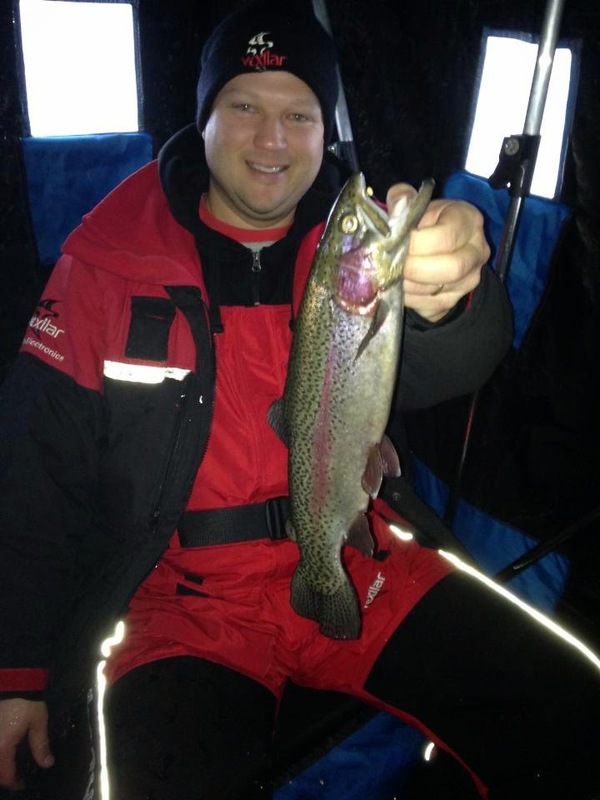 The target fish was trout, a first for me while ice fishing, and a first in a couple decades for me to fish for trout. We found the Rainbows really wanted a couple waxworms on this day, and that they were either close to the weeds or suspended in the five-foot range. 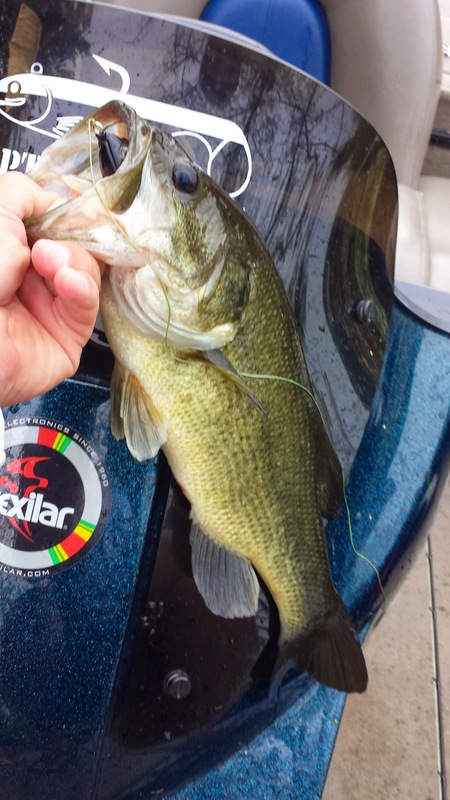 The Vexilar FLX-28's really helped us key in on those fish in the weeds and the suspended fish showed This combination worked on each of the lakes. 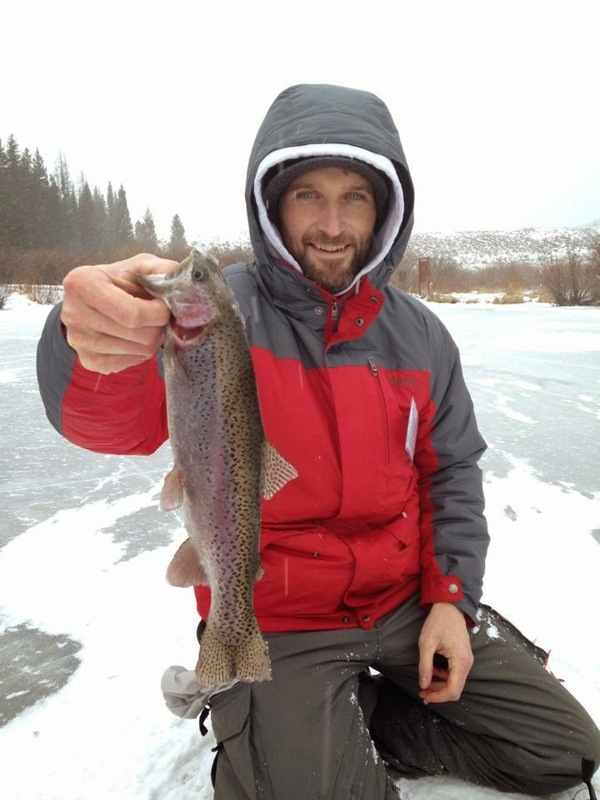 Rainbows of all sizes and few smaller Brown trout were caught that day. Quite a few of the Rainbows were over the 16-inch mark. I was once again reminded how hard these trout fight. A very solid and muscular fish gave our line and ice rod combos a test each time we hooked into one. We decided to keep a few fish for dinner. 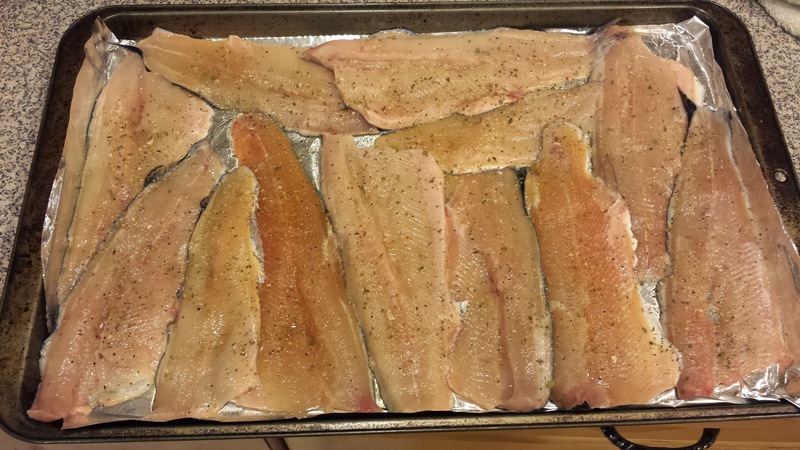 I filleted them out, added some garlic, salt and oregano and in about twenty minutes they were a fantastic way to end the day. The second day we decided to hit the main lake from the first day and then hit one more before heading back to Iowa. Nothing had really changed from the first day, fish were either directly tied to the weeds or suspended. The main difference in this day was a large school or Brown trout that kept visiting us. It was neat to the coloration on these fish and to watch them swim away in the crystal clear water. To sum things up, it was quite an experience. The scenery cannot really be put into words, the fishing was great, the company was equally great. I even managed to eat a buffalo burger before we left Colorado...quite a whirlwind trip! The past two Saturdays I've had the opportunity to work along side the folks at the Cedar Falls Scheels Store. I was there to help with product knowledge about Vexilar electronics. These two days gives me a chance to get out to the public and speak to retailers and customers. This gives me a valuable outlet to the numerous customers that already own Vexilars and potential customers. 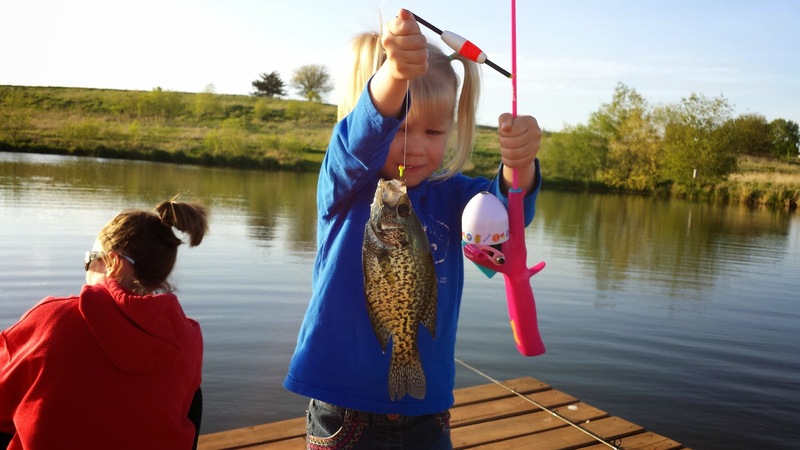 It is always fun to speak with people that already own a Vexilar and talk about he model they have, and normally they always bring up that it allowed them to "beat" their buddy ice fishing, or allowed their kids to catch some panfish at a pond. Both scenarios are always great to hear about! With each story and conversation there is always the inquisitive side of the consumer. Even if people have owned a Vexilar for years, they always seem to have a question or two for me about heir model, or how is this model vary from another. When this opportunity arises I turn to teacher mode and try to help them understand the many different products that Vexilar offers. 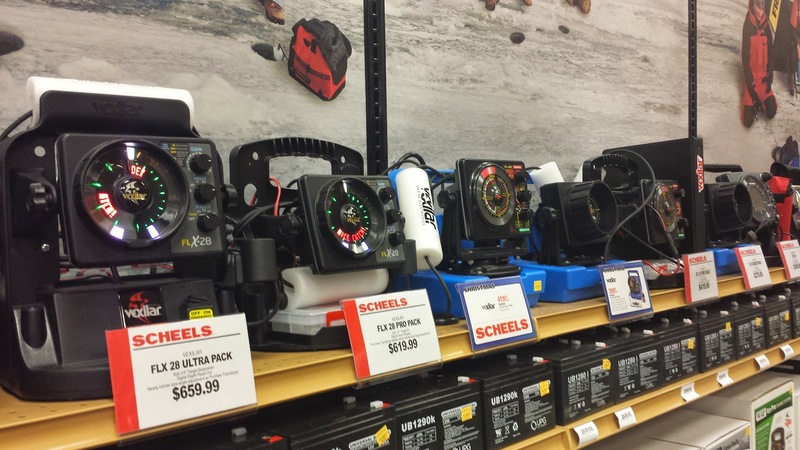 It is always fun and rewarding talking with customers and the staff at Scheels about the products and it is really fun to hear the great stories of fish catches that the Vexilar brought the anglers. and Hank's Bait and Tackle in Waterloo. Recently I was asked to do a seminar on using Vexilar Electronics while ice fishing. I have had the opportunity the past few years to do several of these, and interact with hundreds of people. While conversing with all these avid ice anglers, one of the most interesting things people comment about or are glad to hear about is the explanation of the different colors of lines. Below you will see the graphic that helps people understand what the Vexilar is showing us. The concept is easy, the green line is further away from the center of the transducer, the yellow is a little closer to the center, and red is directly below the transducer. These simple facts are basic and are known by almost all ice anglers using a Vexilar, we all want to see red! We all can take our fishing to the level by understanding what the Vexilar is telling us though. Not only do the colors tell us how far away from the middle they are, but it tells us the depth too. As seen in the illustration below, all the crappies are at the 7.5 foot level under the ice. However the Vexilar is telling us that one is at 7.5 feet, one is a little past 8 foot, and the last is well over the 8.5 foot mark. The crappies are not stacked on top of one another as the Vexilar suggests. Remember, a sonar works by sending a signal through the water column and bounces back up when it hits something. The "green" crappie is further away from the transducer, so the signal travels just over 8.5 feet and then bounces back which reads that distance and marks it on the Vexilar. 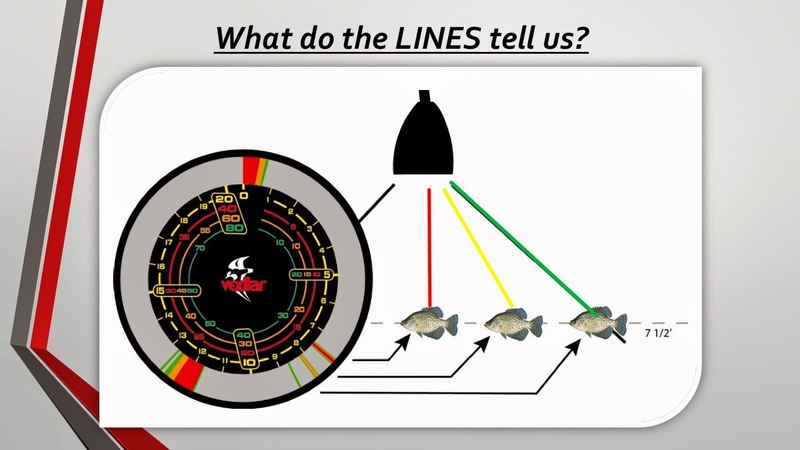 So, we have to train our minds that the green and yellow marks are ALWAYS above where they are actually showing on the flasher, because those fish are away from the center of the transducer, thus the distance of the sonar signal travels farther to go the same 7.5 foot distance. I hope I have recreated a part of my recent seminar so that you can understand what your Vexilar is telling you, and so you can keep your bait above your "true" targets! the landowner's next family meal. Once again the ice on larger lakes here in Central Iowa is just not ready. So that left my buddies and I to head to some local farm ponds. The smaller, more protected bodies of water will always freeze up more quickly. Pond #1 held bass and bluegills for the taking, however their mood and location was a tough one to figure out. David, Brian, Jacy and I managed about a dozen gills and moved on to pond #2. This pond is one I try to fish a couple times a year, it has bass, gills and crappies. Jacy and I went into search mode with the K-Drill and Vexilar FLX-28. Like in the past we found roaming fish in the deep basin of the pond. We set up, shed our coats and had a wonderful time picking off the roaming fish. Every single fish we caught was suspended making the Vexilar a key piece of equipment. This pond provided the best quality of fish I have caught in this young ice season. With the recent warm-up I'm not sure how the ice will hold up in this part of the state...with any luck it turn cold very soon. Ever since I started ice fishing back in middle school, there were two types of augers, hand and gas powered ice augers. Nothing changed for about 20 years. Over the past few years companies have introduced two new types of augers, electric and propane. I have used many different types of electric augers and the Jiffy propane auger in the past couple years. I don't have a comparison to the propane auger, but this winter I have been using an electric auger every time out. The K-Drill has out performed and lived up to every expectation. Why choose an electric auger when I already have a gas auger? I know that is what many of you thinking right now. The list of advantages of electric augers include: no gas mix, lightweight, small, easy to move place to place, and it is renewable energy. 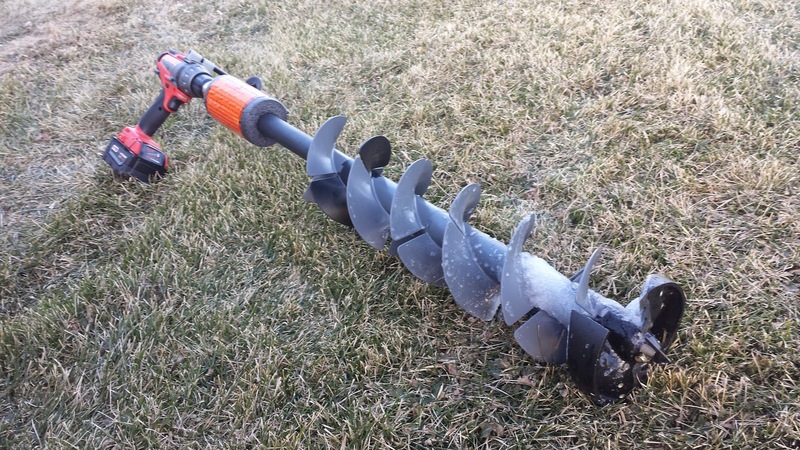 The only real draw back of electric augers is that if you are planning on drilling a lot of holes through thick ice then your batteries may run out. 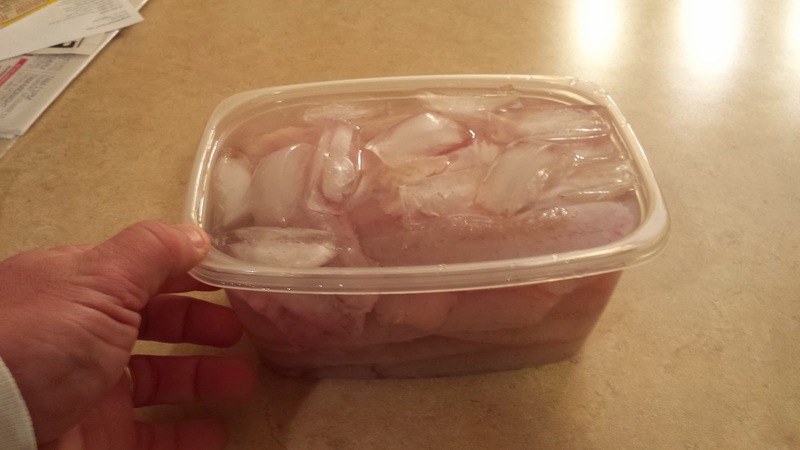 The ice hasn't been real thick, so I haven't had this problem yet. This drill attachment is a home-run. I have noticed that by keeping the battery off the drill and in a coat pocket does increase the life. Recently I gave it a tough day on the ice. The battery lasted for almost 80 holes, which were about 5-6 inches thick. Roughly put, it drilled about 35 feet of ice over a 3-hour period. Please contact me via email with any questions you may have! Or if you live in Centrial Iowa hopefully you will be able to see it in action. The people who took part in this event for 2014 were not disappointed. This annual event is held around December 1st of each year. Like last year, Vexilar sent me up to Hank's Bait and Tackle to help with in-store sales and to provide a seminar about Vexilar products. Each year this event, and it is truly an event, with food, drinks, all-day long seminar speakers, fully assembled ice shacks and more ice fishing tackle than one can imagine overachieves the year before. I am not sure if it can get much bigger in 2015, but Mike at Hank's Bait and Tackle will most likely make it bigger and better if that is even possible. The seminar speakers that attended this year included; Tommy Skarlis, Scott Reed, Tom Gruenwald, Adam Audette, Dan Johnston, Brian "Bro" Brosdahl, and myself. I am honored to be a part of this group, and each seminar left its audience with a vast amount of new ice fishing knowledge. If you have never been to Hank's Bait and Tackle in Waterloo, Iowa, make it a point to do very soon. You will simply be amazed at the selection and the knowledgeable sales people they have. Also, if they don't have it, they will get for you. It's pretty amazing to have a shop like this in Iowa. I was able to sneak in and listen to brief moments of different seminars. 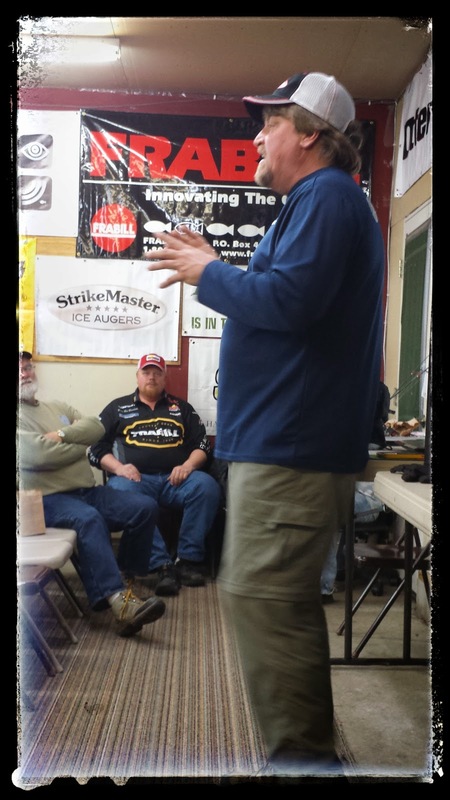 Each speaker was able to use their time to inform ice anglers of current trends in the latest ice fishing equipment, bait rigs and a glimpse into how angler should think while pursuing fish on the ice. Each time a seminar concluded the mob of people would come out of the seminar room and be buzzing with the new information they hear about. People were soaking in the knowledge being shared and that is what this great annual event has come to be. A big applause goes out the guys at Hank's Bait and Tackle, especially the mastermind behind it all, Mike Everett. 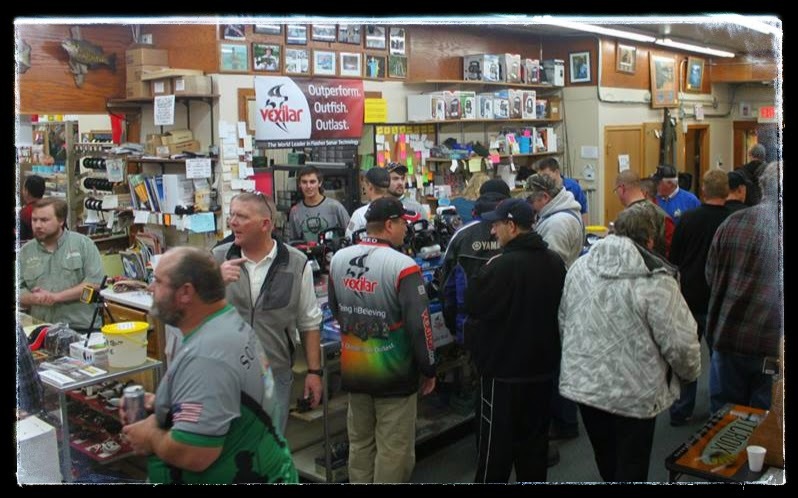 If you missed out this year, stop in to see the huge selection for ice fishing, and make it point to attend in 2015. Cold...warm...cold...warm...cold! Mother Nature just couldn't make up her mind in November, and on the last day of November, the wind chill was below zero, go figure. There is really only one thing to do when the weather is like that, go ice fishing. Actually I wasn't too sure any fishing was going to take place today after the warming weather we had earlier in the week and temperatures near 50 yesterday. 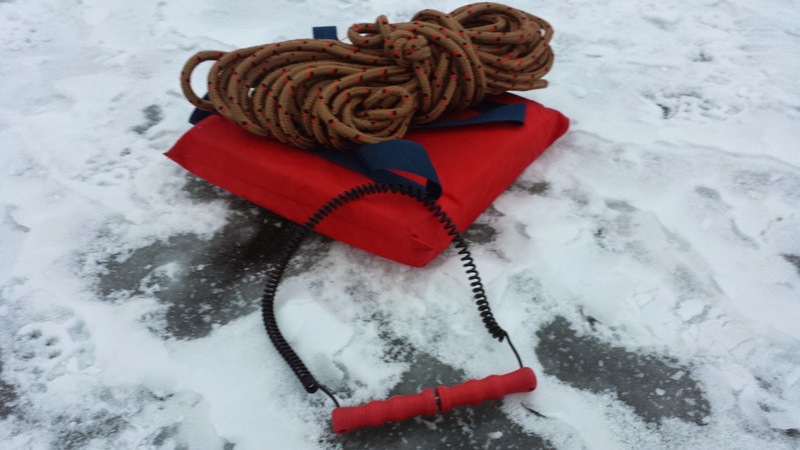 However, there is only one way to know exactly how thick the ice is...go out and check it. None of the local, larger lakes are even close to being ready for ice fishing, so I obtained permission to look over two different farm ponds south of town. I wasn't expecting much, but found good ice at both ponds. The ice is still very inconsistent, we saw 2-inches of ice all the way up to almost 6-inches of ice. 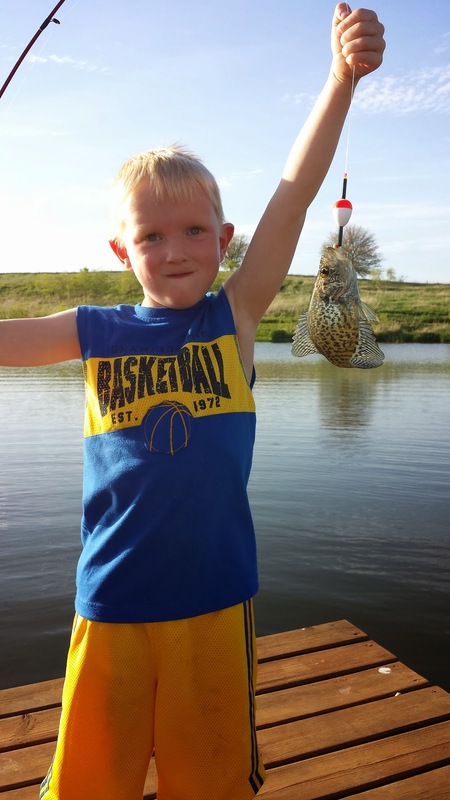 Crappies, bass and mostly bluegills were found today. 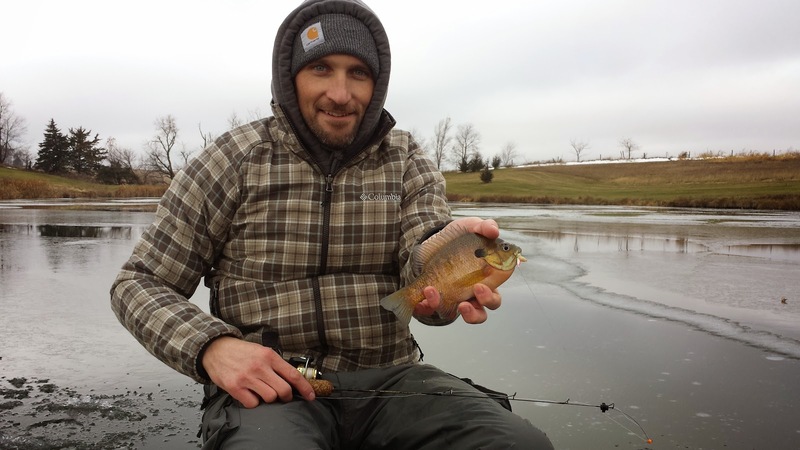 The bluegills were actively roaming the deeper basin of the second pond and feeding heavily. 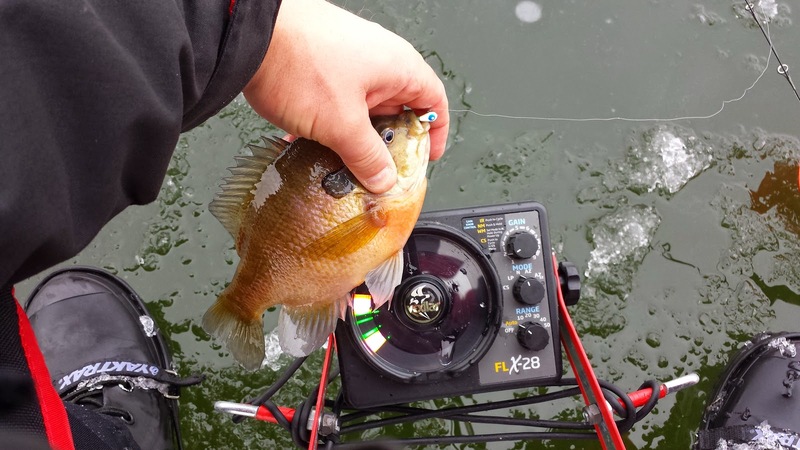 The Vexilar FLX-28's were lit up most of the time with schools of bluegills roaming through the area. Most fish were suspended about 3-4 feet of the bottom, so picking them off with the Vexilar made things pretty easy today. The gills did prefer a white colored jig, and any color plastic or waxworm would work. The key on this pond today was getting into the deepest water where the gills were feeding. Hopefully the cold weather forecast for the week is correct and some larger lakes will ice up this week, if not some more ponds might be the place once again next weekend. A look at how the first pond appeared. After "icing" a few fish on Wednesday, I was so eager to get out Saturday morning and check a few area ponds. The temperatures were on the rise, reaching into the 50's with light rain, however Sunday was even worse with more rain and temperatures in the 50's all day long. I know the current ice that has formed on a few small ponds is no doubt turning to water as I type. Mother Nature can be cruel...this just proves it once again. This is a view I never get tired of. of crystal clear ice, I could hardly believe it. I gladly shouted out, "let's catch some fish!" We all managed to catch a few fish at the first pond, all bluegills and some real solid ones too, reaching toward the 9-inch mark. There is no real structure in this pond, so we just waited the fish out until they cruised by our baits and gave us a chance to catch them. Days like this made us all glad that we had our VEXILARS with us to show us the deepest roaming areas, and when the fish were below us. A few hours passed and we all decided to head out. Don called it a day early, however Jacy and I forged on to the next pond, hoping to see good ice, which would hopefully lead to catching some more fish. Good ice was found once again, averaging about 4-5 inches thick. So a fishing we went. At this pond, the bluegills seemed more active, we caught numerous gills in the couple hours we there, a couple small bass and even saw a huge catfish up at the hole several times...however it never made it on top of the ice...after a lengthy battle the line broke. All in all it was great morning, November 22nd and we were ice fishing in Marshall County...I have never done that in the past 15 years. However, I type this as the rain has been eating the ice away pretty much all day here in Marshall County. What will the ice look like a few days...it is really hard to say, but I do know that temperatures right now are around the freezing mark and are supposed to stay that way for the next several days, so there is hope. Be safe out there everyone, and enjoy this early winter. are necessary this time of year. The only nice thing about this arctic blast of cold weather is that the lakes/ponds are starting to freeze at record rates. I have lived in Central Iowa for 15 winters, this is by far, by a couple of weeks the earliest I have ever "walked on water". FACT: I was catching bass out of my boat just 10 days ago! I have been monitoring an urban pond, and tonight was the night to take that first step. The first step led to a few more, and then plenty of test holes. The ice varied A LOT, form about 2 inches all the way up to 4 inches. This is no doubt because of some recent snow we received this past weekend. Snow on top of ice actually slows down the process of freezing the lake water. Either way, with all the proper safety gear in hand we made our way onto the ice and ended up with a dozen or so fish in about an hour. It was sooooooo nice to see the RED lines on the VEXILAR, and then feeling that bite! 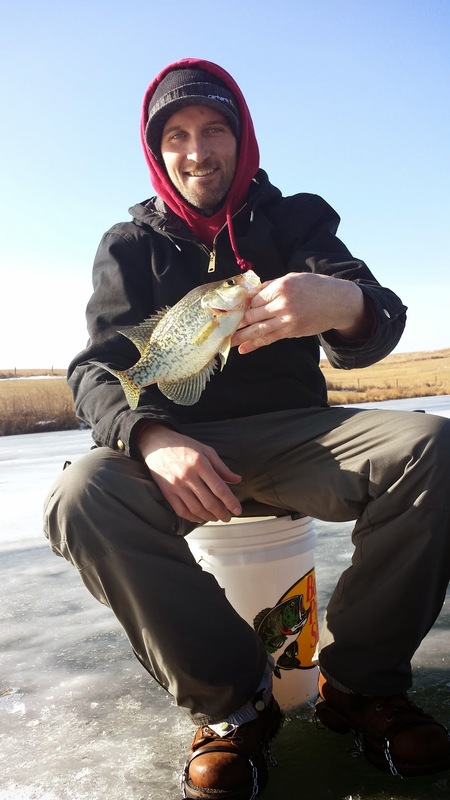 A very successful and much anticipated trip on the ice. 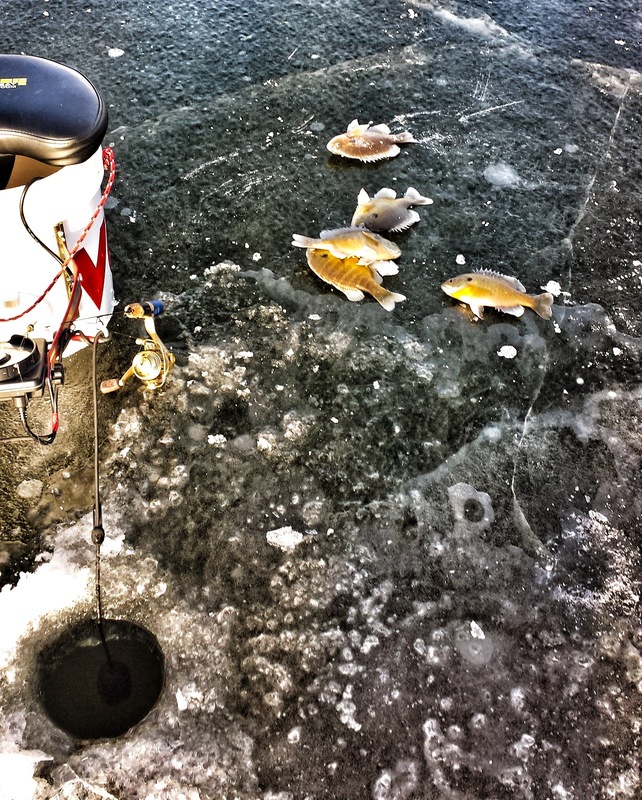 I hope this weekend finds me on the ice for some more November ice fishing action! November is always the time of year where I am torn between the two things I love about the outdoors; fishing and ice fishing. Yes, they are similar, but they are totally different in so many ways too. Today marked the last day for me fishing in the open water. A quick trip to Hawthorne Lake with good friend Don Henry ended the year. We caught 3 bass in the 48 degree water and had some fun. Everything worked great one last time on the boat which is always nice to know going into the long winter. I winterized the Yamaha and will empty everything out in the next day or so. It is always sad to close the garage door on the boat for the last time, but that means I can anticipate the upcoming ice fishing season. One that might be here earlier than ever! 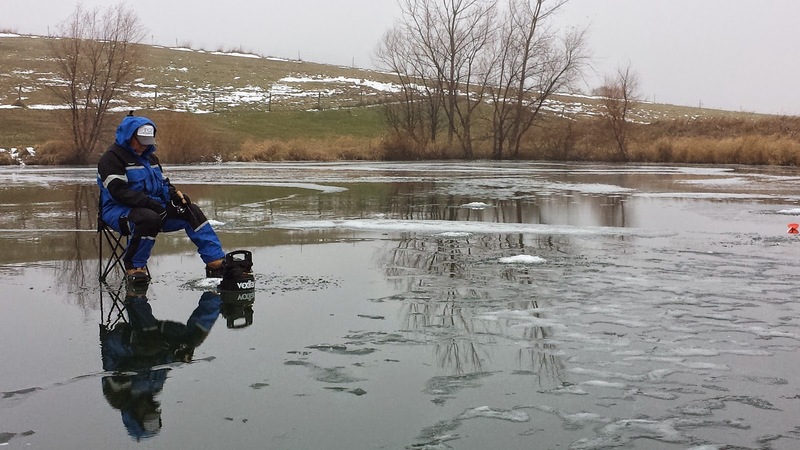 So, with the cold weather coming into Iowa on Tuesday, I can finally say that I am ready for the ice fishing season. It was a great year on the boat, I shared many hours with friends and family and caught hundreds of fish, including the biggest bass of life back in April. A lot of memories and pictures from the year, so those I will always treasure. I am also fortunate enough to be adding another Bass Club Angler of the Year trophy to the house as well. 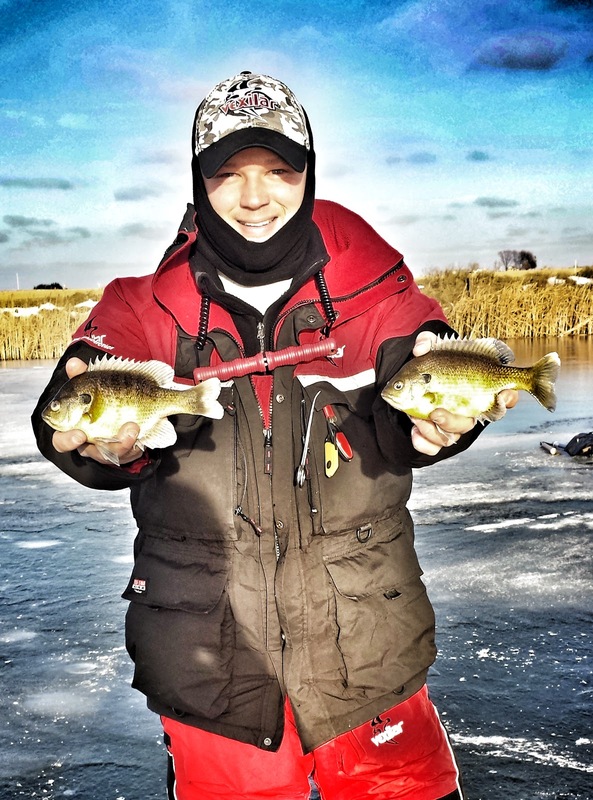 I sure hope the ice fishing season is as fun as the open water season was! 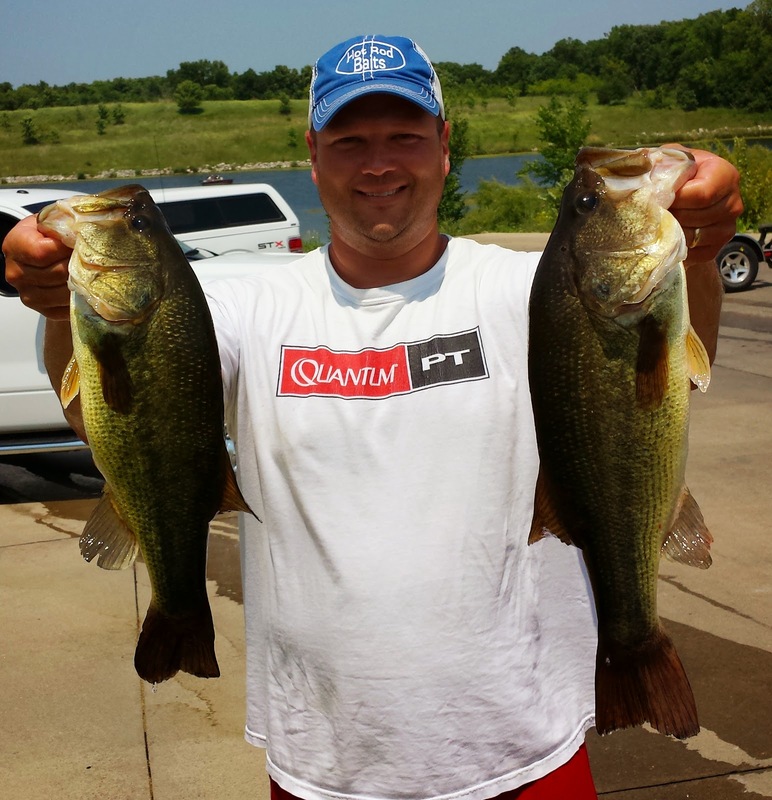 This past weekend was the finale of bass tournaments for me in 2014. It was the final event of the Tri-County Bass Club season. Back in March I made the decision to fish the entire schedule and set a goal for myself to win Angler of the Year. I hadn't fished many tournaments in the club the past three years, focusing on other events, but I really missed the friends that I have made in the Tri-County Club. 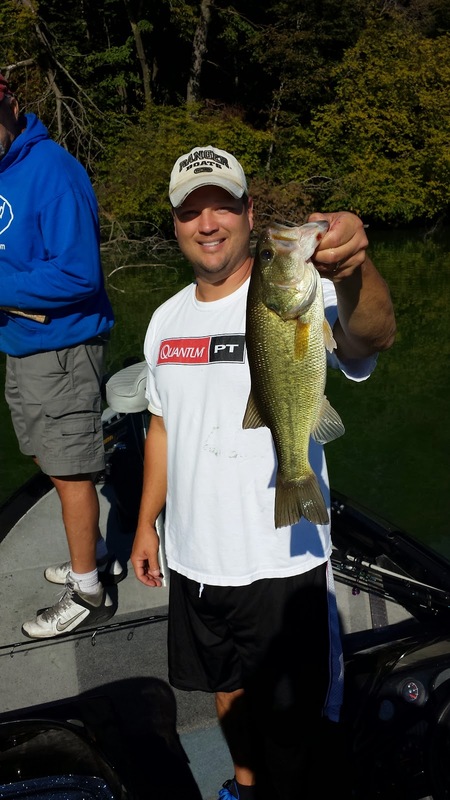 I really enjoyed the tournaments this year and each venue brought on a different challenge from the bass. The last event at Pool 9 was no different. This part of the river is my favorite place to fish for bass. I had been looking forward to it the whole year. Going into the last event, I was the overall points leader in the club for Angler of the Year. I decided to really "swing for the fence" during my practice day on Friday. We covered a lot of water in northern part of the pool, and found where a few bass were hanging out. 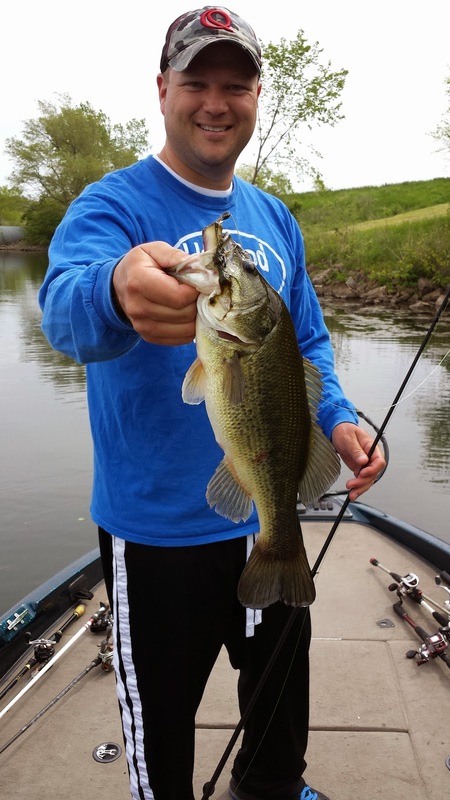 I didn't feel real comfortable with what we caught, but didn't fish one area of the pool that is known to always have a few bass in it during the fall months. We did check out the water quality there and it was nice, also seeing about 30 boats panfishing on a Friday told me all I needed to know...there were a lot of fish starting to use this backwater area of Pool 9. Instead of playing it safe, I went to the southern part of the pool in search of some big smallmouth bass on the first day of competition. That plan never really came together. I only weighed in 4 keeper bass out of the possible 5 and only one weighed more than two pounds. It was not what I was hoping for. Before I even made it back to our motel room, I decided to head to the "old stomping grounds" and play it safe on the second day. It was the right move to make, and my partner and I both had a limit of 5 bass within a few hours. It was steady catching throughout the day, and a great way to end the year. Looking back at this event and all the other times I have competed in tournaments it still amazes me how well my equipment treats me. My Quantum rods and reels once again have amazed me this year. They are so durable, and you can quickly tune the reels in to cast a mile if needed. 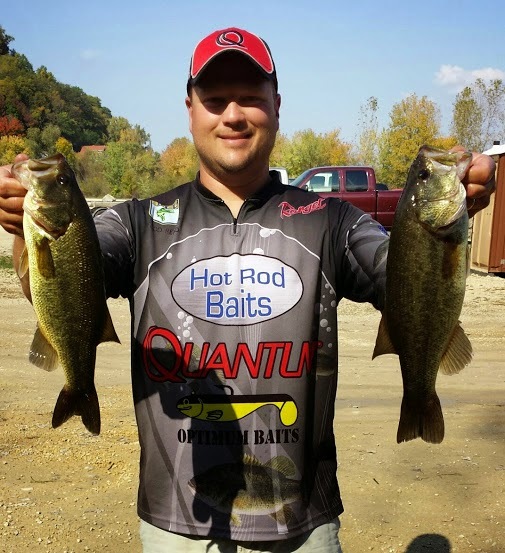 The life-like swimbaits and unbeatable frogs from Optimum Baits and all the soft plastics from Hot Rod Baits caught almost all of my fish this year. The confidence I have in these baits are amazing, and they clearly catch fish! I ended up in 4th place for the event, but was crowned the Angler of the Year by quite a margin. Something I set my mind to a long time ago, and I am very proud that I can say I am 7-time Angler of the Year in the Tri-County Bass Club! I am fortunate to have a reliable Ranger Boat, Yamaha motor and my trustworthy Minn Kota trolling motor. September is always the beginning to the end of the open-water fishing season. Bass tournaments are winding down and my brain starts to think about ice fishing. The past two weekends I spent some time with friends chasing bass at area lakes. I love fishing bass tournaments, but there is something about just going "Fishing". Those of you that fish tournaments know where I''m coming from. Every second of every tournament counts. It is a rush all day long to try to accomplish the goal of winning the event. At times, this motivation takes the place of the enjoyment of nature and the act of fishing. Between tournaments I like to enjoy to meet up with friends, and "just go fishing". with Dave Jordan. We had a great time talking fishing, life and the last tournament of the year which is coming up. We caught a few keeper bass that day along with a couple dozen other bass. 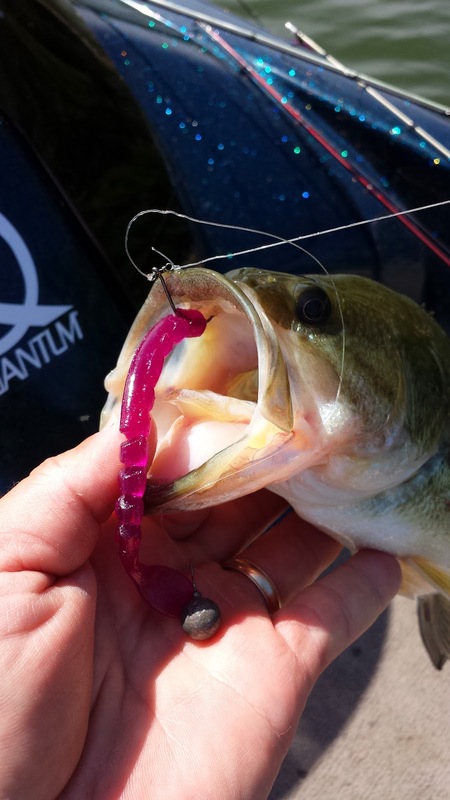 Most fish were eating Hot Rod Baits Tubes, or a finesse worm. The water color clarity was good for the lake, and the colors of the baits didnt' seem to matter. That brings me to todays' outing at Hawthorne Lake with friend Jacy Large. I have ice fished several times with Jacy, but this was the first outing in the boat together. We dodged a few rain storms on the day, and between them we caught some nice bass. 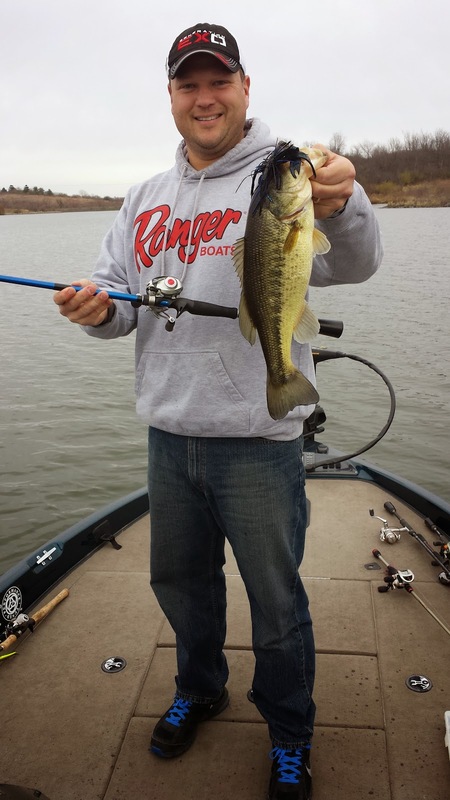 Today, it seemed like the bass were hanging in the 10-foot range, and they were eating crankbaits pretty well. A few fish took some slower presentations, but it didn't account for too many of the 20 or so bass we caught this morning. Looking back at these two trips, it was all about the fun, the act of catching a few dozen bass was just a bonus to the great company! Next up, the Tri-County Bass Club Classic tournament, which will decide the Angler of the Year at Pool 9 of the Mississippi River. No, that wasn't my recent performance in a bass tournament! However, this past weekend was my second to last bass tournament of the year. 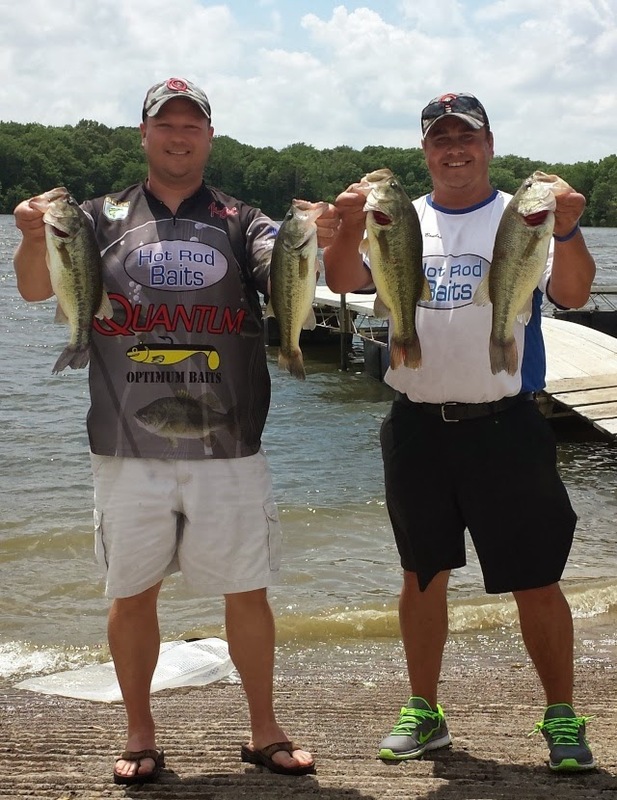 The Tri-County Bass Club had the event at Lake Belva Deer. 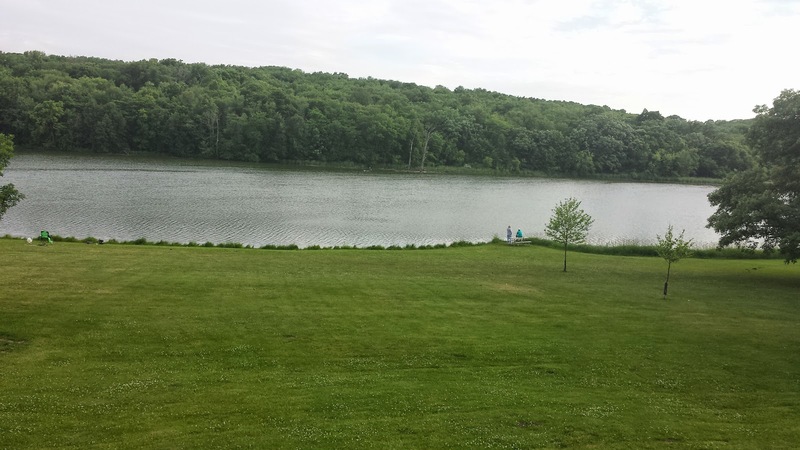 This is a lake that is up and coming for bass anglers here in Iowa. It is full of bass and in the past couple years the bigger fish have started to appear. The one down-side to the lake, other than being a little over a 90-minute drive, is that it is relatively small. It is only 264 acres, and seems much smaller than that in the middle August. With 15 boats in the event, fishing areas were at a premium. I had a chance to scout out the lake the weekend before, and I had a good game-plan ready. The fish were holding in their typical summer places, deeper water, off channels, and suspended in the flooded timber. That day was sunny, with little wind...fast forward to this past Saturday, storms, several directional changes in wind and clouds most of the day. My game-plan was no good, however I hunkered down in the most productive area I found the week before and made the adjustments for the current weather. Clouds, several storm fronts and wind had the fish scattered, but still feeding in the area. I quickly got two keepers in the livewell flipping a Hot Rod Baits River Minnow Tube along the weed edges. Then the lightning and storms really hit the area. At about 6:45am I decided to sit in the bottom of my boat for the next 1.5 hours. I have never done that in my 20 years of fishing bass tournaments. However, with so much lightning in the area, I just couldn't keep fishing. I tied to a log and sat/laid in the bottom of the boat playing on phone. I was content, and more importantly, I was safe. After the lightning had passed, I was back at work. It was still cloudy, so I just kept fishing how I caught my first two keepers. It wasn't too long, and keeper #3 made its way into the livewell. I was feeling pretty good, knowing that on a strange weather day that several anglers probably wouldn't catch a limit. I kept at work, knowing that I just need one big fish. After going through a lot of shorter bass, the big one made an appearance. I set the hook, and up it came. It boiled on the surface, and I said out loud, "that's the one". I played it out a little bit and flipped it into the boat. It was a long fish, but skinny, it weighed exactly 4.00pounds. I was stoked! I kept working the area over, going through some keepers, and I made one more upgrade before the end of the tournament. All that was left is bringing them to the scales. 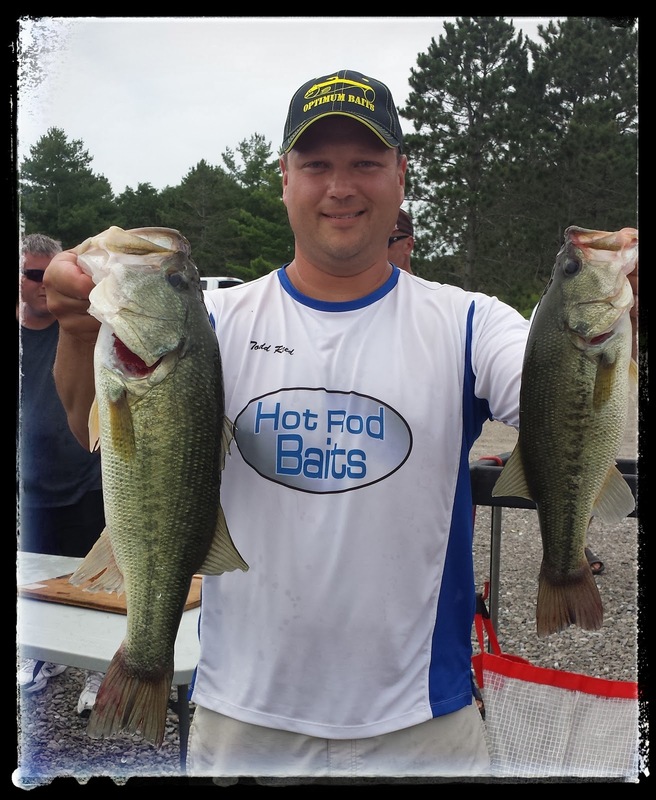 My buddy Doug Chaloupek weighed in quickly and had just over nine pounds, I knew I didn't have that much, but was scared that others had big limits too. Turns out, I came in second place and that 4-pounder was the big bass of the event. It was an awesome day, and most importantly I picked up another Top 3 finish and some very valuable Angler of the Year points. With only one event left, there is no room for a slip up. Needless to say, I am looking very forward to getting up to Pool #9 for the finale of the season! 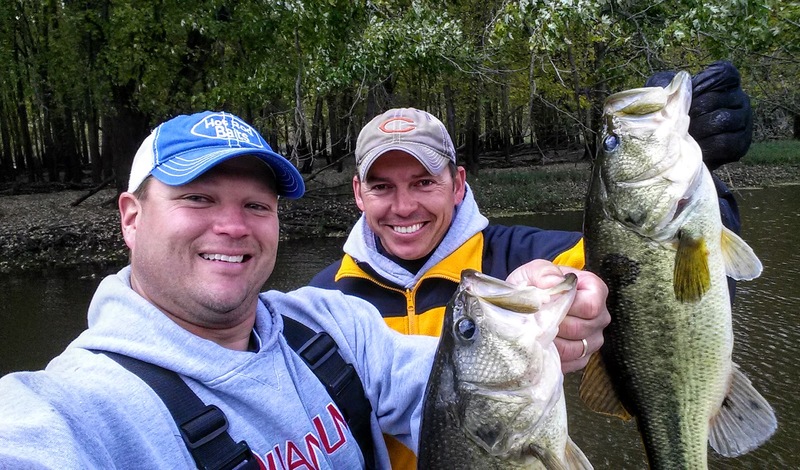 This past weekend Brian Bowles and I teamed up once again in a club event on Pool 10 of the Mississippi River. We had about a half of day on Friday to look things over for a two day tournament. We decided to go to Pool 9 and check things out, if we didn't find anything, then we knew that our focus would be in Pool 10 the entire weekend. 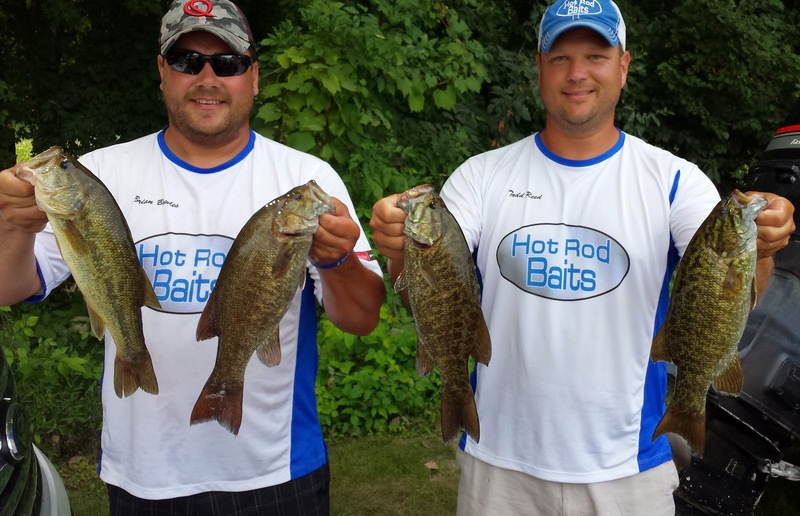 We found a few areas that were holding fish so we knew we were headed there the first day of competition. Saturday morning came and we headed north. We filled our limit of 6 bass in about 3 hours and started to upgrade our catch. 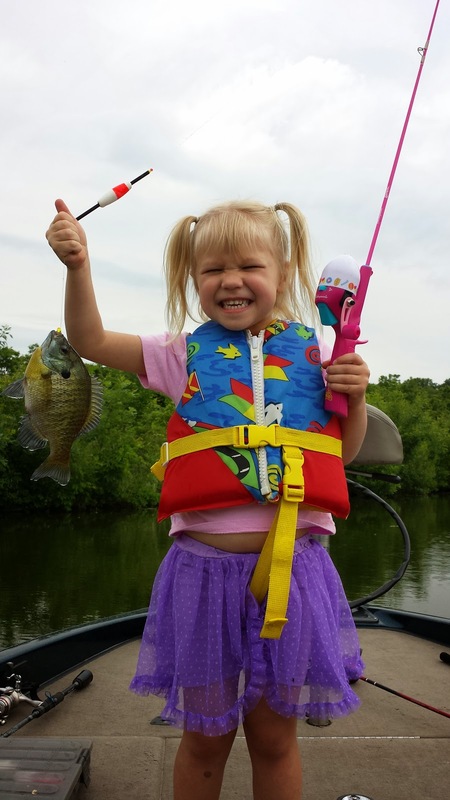 We caught dozens of smaller fish, which kept the day a lot of fun. We focused on trees and eel grass in current. These areas were also loaded with minnows, making our bait choice an easy one. 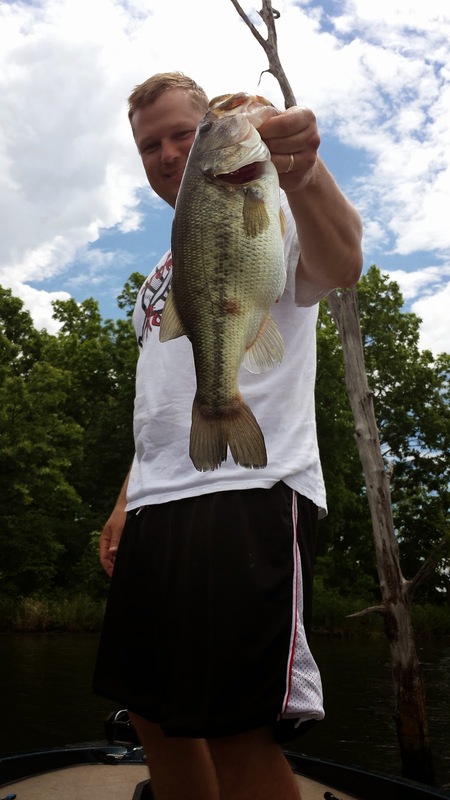 Most bass were caught on the Hot Rod Baits River Minnow Tube. We ended day one in the lead by a slight margin. With that news we decided to stick to the same plan and hope the similar or better results. Sunday came and off we went to our best spot. We caught a couple bass right away for our first two keepers of the day. After that, no bites, not even smaller ones. Something had changed, but what was it? Mayflies...they were not in the area this day, and thus the fish left. A simple little bug put a damper on our day. We hit some other areas that we caught fish on Saturday and even expanded on those areas to fill our limit and upgrade slightly a few times. I knew we didn't quite have the weight we did the first day, and I had a bad feeling about things. The bad feeling was true, we ended up 0.09 pounds out of first place. Yes, a few drops of water, but that is how things go in world of fishing tournaments. I have been on the other side of a weigh-in like that, and this time it was my turn to denied by a narrow margin. It was still a great weekend, made some money and spent time with a great friend catching Mississippi River bass. The sport of bass fishing takes up about 7 months of the year for me. From April 1st to the end of October, fishing for bass is on my brain constantly. 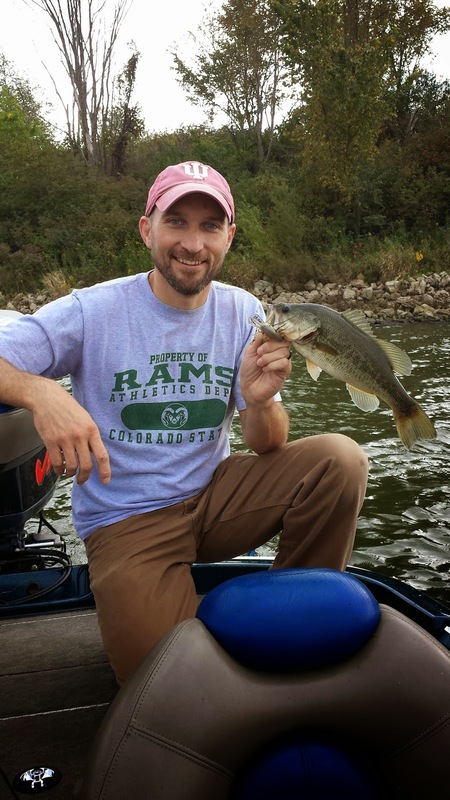 Whether it is thinking about different lakes, what the weather might be doing to the fish, or the water levels of lakes and rivers, bass fishing is on my brain. No matter how long I think or study up on these topics and dozens more, nothing beats getting out there on the water and fine tuning things. I took the opportunity between family obligations and bass tournaments to do just that this past Friday. 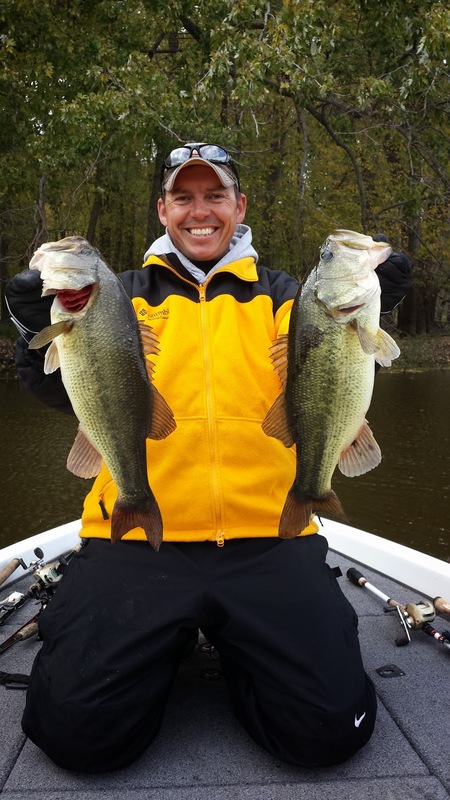 The word "practice" gets used quite often in the realm of bass fishing and tournaments. 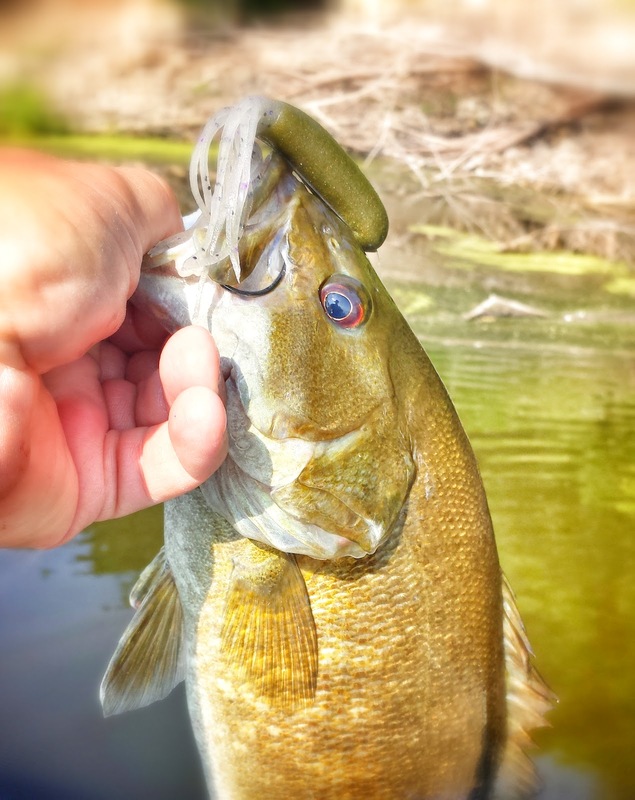 Practice can mean a couple things, first, the actual idea of going out to the lake or river and finding fish and trying to figure out where they are living and feeding for a particular day. Secondly, practice can mean actually using a specific technique and "fine tuning" your equipment and your skills to use that technique properly. It is just like taking batting practice or going to the driving range to work that slice out of your driver. 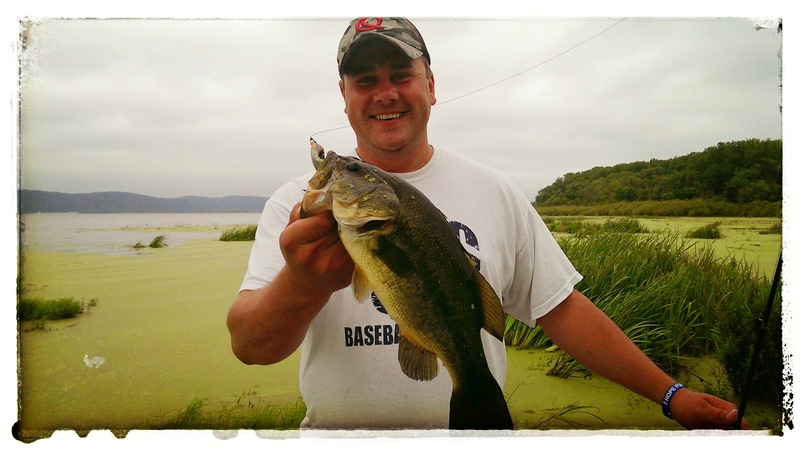 This past fishing trip had the bass holding off-shore along a weedline. Normally bass can't resist a crankbait in this situation, but on this particular day they wouldn't touch one. The fish were not very aggressive and wanted slower baits, this gave me some practice time on the drop-shot rig. This is a rig that takes a lot of practice to get the "hang" of it. In my experience with this rig, the bites are soft, and most of the time are not actually felt, but seen. Something that takes a lot of focus and concentration. I was glad that the bass were in a mood that allowed me to work on this technique, as a tournament angler, you just never know what technique you will need to bring in those keepers! This past week I arranged for us to stay at a cabin at Hickory Hills Park for a couple nights. It was the first adventure in staying overnight which didn't include a relatives house or a hotel, so I/my wife weren't quite sure what to expect. What we found out is that a 3 and 6 year old can grow up fast and they loved it! The park is only about an hour away from home, so an emergency bail-out and trip home wasn't out of the question. This was never even though of during our 3-day stay, I guess we were too busy having fun in NATURE! 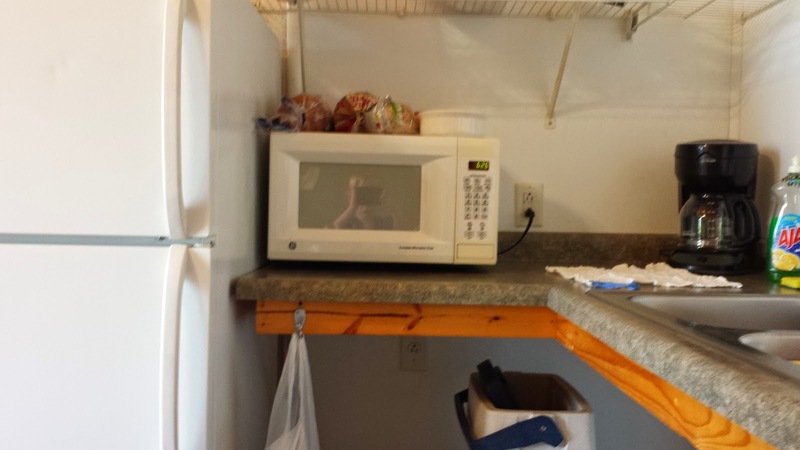 The cabins were fully equipped, like many of the state and county parks in Iowa and makes for a great time to be close to the outdoors, but still have those nice conveniences of home. With 2 small kids, this was a great option. We kept things simple with food items, spent most of the time outside on the boat or walking around the park. The weather was great, about 70 degrees partly sunny, we couldn't have really asked for more. 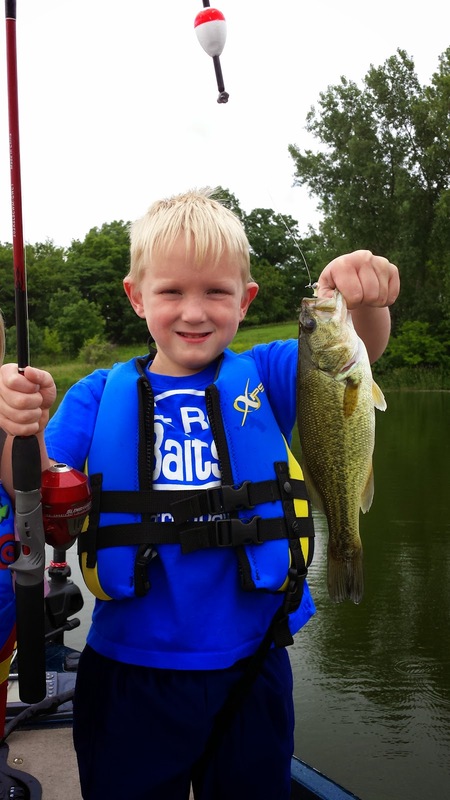 We were able to catch quite a few bass and bluegills on our trips to the lake, and nature was everywhere, something my kids are always on the lookout for. This small trip just goes to show that you don't need to go to extremes to have a great time with kids. Keeping things simple and keeping them active was the only thing needed, and again, we were lucky with the great weather. If you want more information about this lake, just check out the Black Hawk County Conservation webpage. It's a great little gem, found right here in middle part of Iowa. 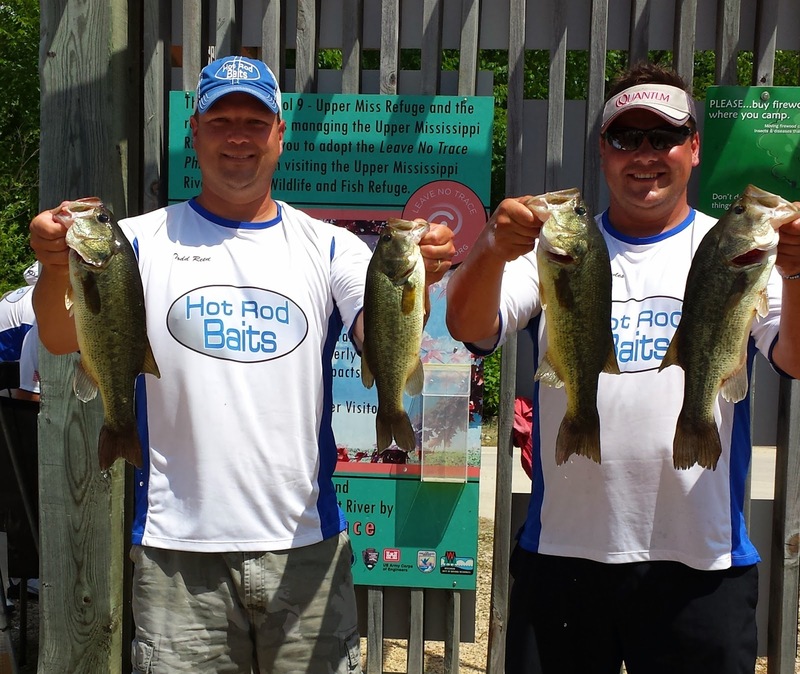 became part of our "Plan B"
June 1st brought the second stop of the Hot Rod Baits Bass Series. Partner, Brian Bowles and I were pretty confident after our practice day that we could bring in a limit of 6 keeper bass. 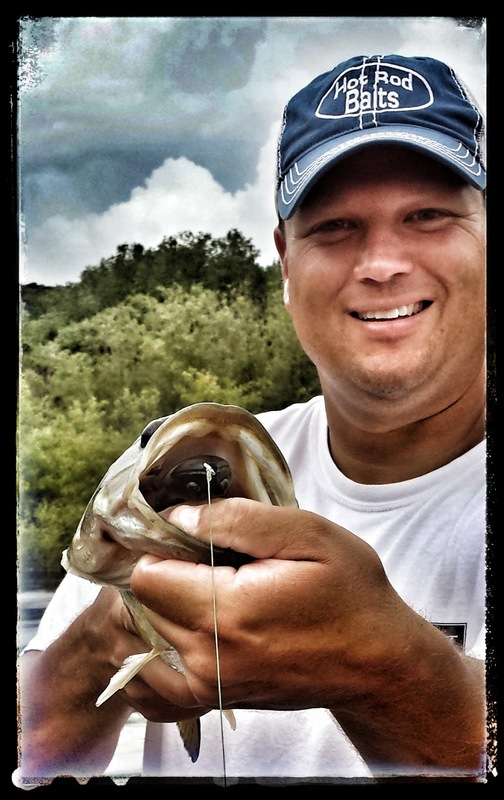 We found fish relating to the flooded grass on a variety of baits and colors. Normally, when this occurs things will stay true the following day. Tournament day was good, and our first move of fishing buzzbaits got two keepers in the livewell very quickly. This is always a nice thing to happen in the first hour of a tournament. With 19 boats in the event, we knew we had to keep improving throughout the day. Slowly, but surely we made our way around the lake to our most productive areas on Saturday and had our limit in a few more hours. As the sun got high, and the fish seemed to disappear from the shallows, we went with plan B. We had caught some nice fish flipping old stumps in about 6-8 feet of water. This was always in the back of our head on tournament day, and we decided to go to Plan B with about an hour and half left of the day. We ended up getting a few more keepers, including one that Brian caught on nearly the last cast of the day. We ended up with 15.70 pounds, and good enough for 3rd place. Not only did we finish with a nice pay check, but earned some valuable points for the Team of the Year race. We moved all the way up to 4th place, with only one event left to go. Neither one of us can wait for the final tournament at Pool 9, a place where we both love to fish! A three-day weekend always gets my blood pumping, because it normally means extra time to fish. This holiday weekend was no different. 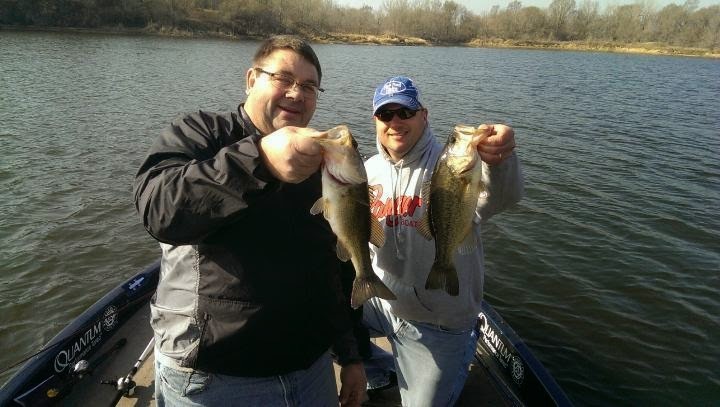 I spent Saturday with good friend Ken Lunsford on Hawthorn Lake. We were after as many bass as we could catch, and Hawthorn is a perfect lake to meet that goal. We caught bass on just about every lure we threw. Texas rigged plastics, drop shot, buzzait, several different crankbaits, jigs, jerkbait, swim jigs, swim baits, and an Optimum Frog. It was a great day on the water, and a good way to get ready for the summer bass action. 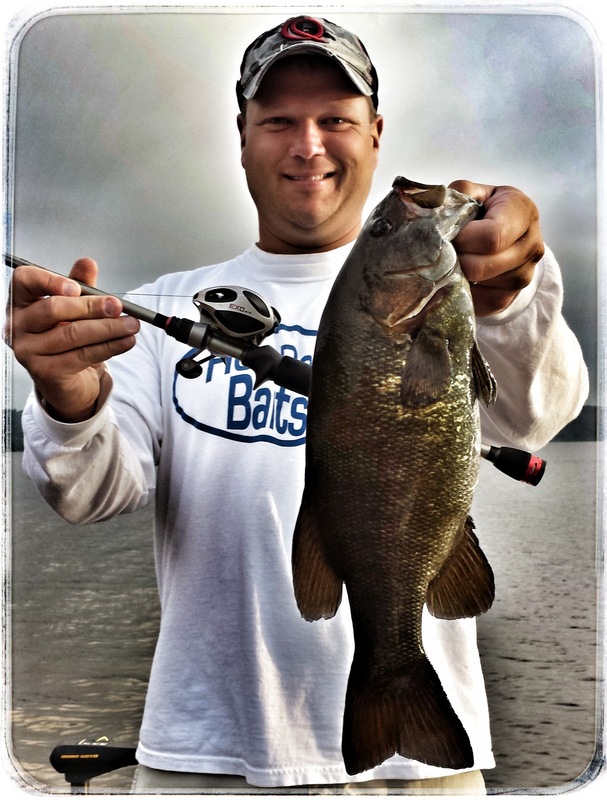 It is fun to hone in on different rod/reel combinations and use different lures to fine tune your presentations. It isn't quite June, but I have used a lot of different baits this spring and I feel I am ready for any bite that awaits me. Time on the water will hopefully keep me catching a lot of bass throughout the season. The evening that day took my family and I to a farm pond. We were most excited to just get out in nature and enjoy the beautiful day. Temperatures were right around the 75-degree mark most of the day. A quick trip to a farm pond was just the thing we all needed. 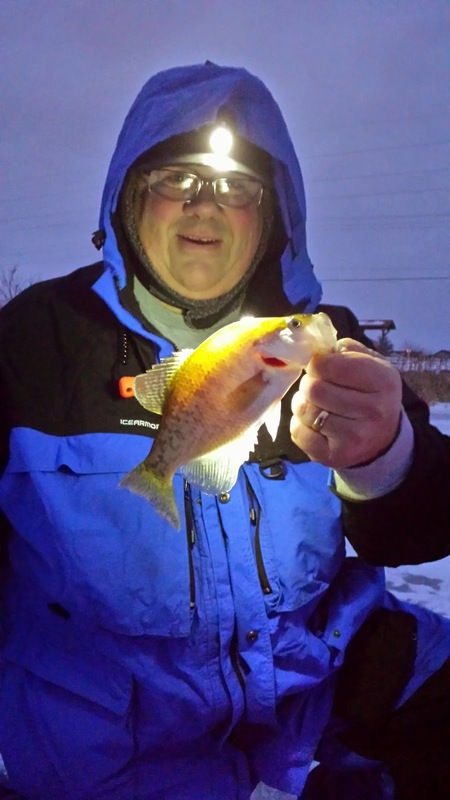 Bluegills and crappies were abundant, and kept us very busy as we took in the evening hours. Hats off to land owners who share their precious ponds with friends, I know this family severely appreciates it! These kids sure can CATCH them! Things were tough...that about sums it up. Only 10 guys in the club made the trip, and only 3 of them had limits the first day (2-day event). All caught them on plastics and jigs on the West Lake docks. I fished the canals most of the day (had the best bites there on Friday, but not a lot, and I couldn't get bit anywhere else). Ended up with one keeper. Sunday came around and I knew I had to fish all different stuff. However, the weather was calling for gusts up to 30mph. This can make fishing more difficult, but in the last two years I don't pay too much attention to the wind, all because of my trolling motor. The Minn Kota Fortrex 101, which runs on three 12-volt batteries is as strong as it gets. I could fish anywhere on the lake and still have the power to maneuver and fish where I needed to be. I sure was glad that Minn Kota got it all fixed up and quickly so I didn't miss any time on the water. I decided to try some main lake docks, rock reefs/points. Nothing on those, so I decided to go up in East Lake. I had never fished this part of the chain of lakes, and I figured I had nothing to lose. I was going to strike out or hit a homerun. I focused in on fishing some deeper docks up there and ended up with 2 keepers. I felt that the decisions was a good one. The 3 that had limits the first day never caught them in West on Sunday. One of the guys blanked, another had 1 keeper, and the other scrambled around and caught another limit. He was on that lake 11 days in a row...it would nice to be retired! All in all, I finished up 3rd place and had a good weekend, all because of one decision to try something new. Water temps on West are 50-52. No smallies were weighed in. My partner caught two of them (the only two out of everyone) but were 10 and 13 inchers. The Okoboji lake system did not show its true colors this past weekend. Normally this fishery is fantastic, but with the recent weather changes, the fish were not in a cooperative mood. ~10:30, threw a jig to a brushpile, and thump...my only bite of the day, a KEEPER though! ~About noon, I was trolling around some stumps and hit one square on, my trolling motor braket snapped, and my motor fell into the lake. All I can say after thinking about that day is...I should have just stayed home! Yesterday was spent on the water with Dave Jordan and David Bowles. Union Grove Lake and a private lake were the destination. Fish were caught, stories were told, and many laughs were had. Something we all needed after a long fishing weekend last week in the rain. A quick picture of David and I with a "double" we had. Slow baits were definitely the choice of the bass on this day.